November has been a very busy month for Lolah! 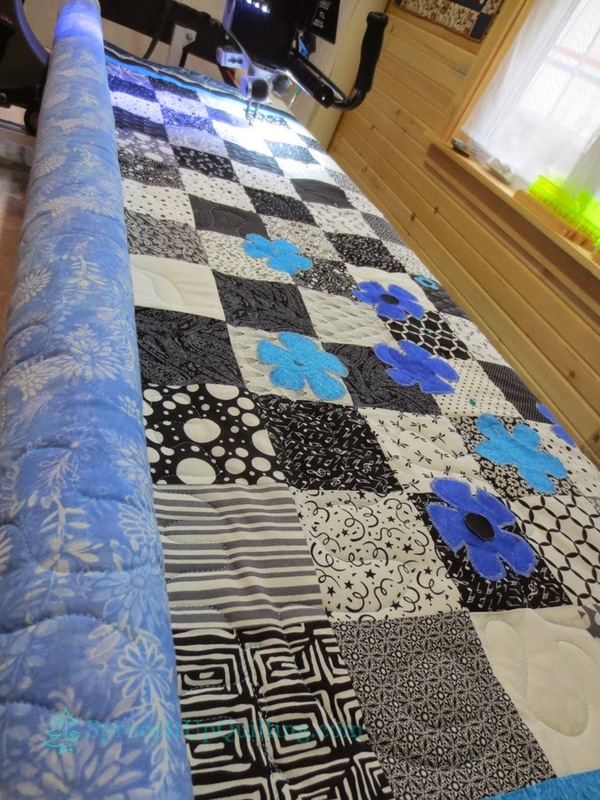 Georgina came by with her beautiful black and white quilt and decided she would try free motion quilting on Lolah. 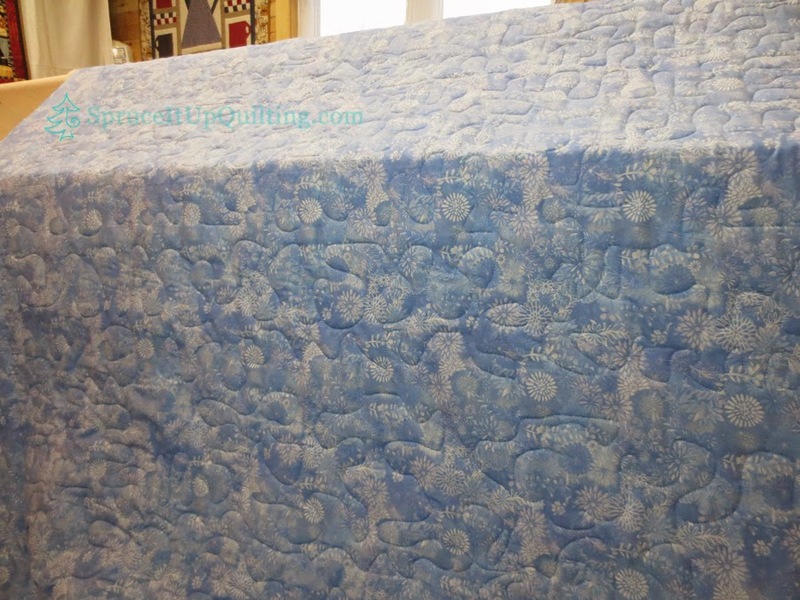 She chose FilTec's Light Turquoise Glide and a double layer of wool batting for her lap quilt. After the wonderful start to her all-over meander, we decided it would have to come out as it was too tight a design. 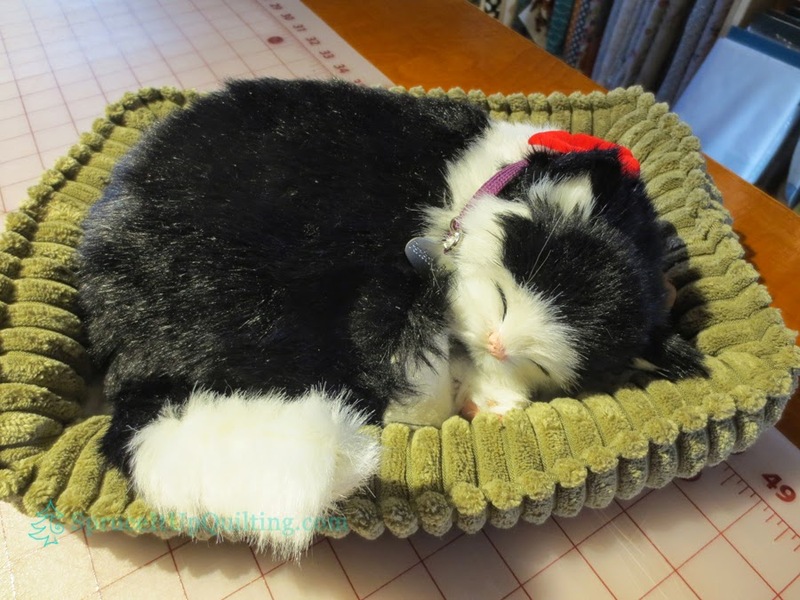 We chose to remove those stitches at the end once she was comfortable with a larger design. 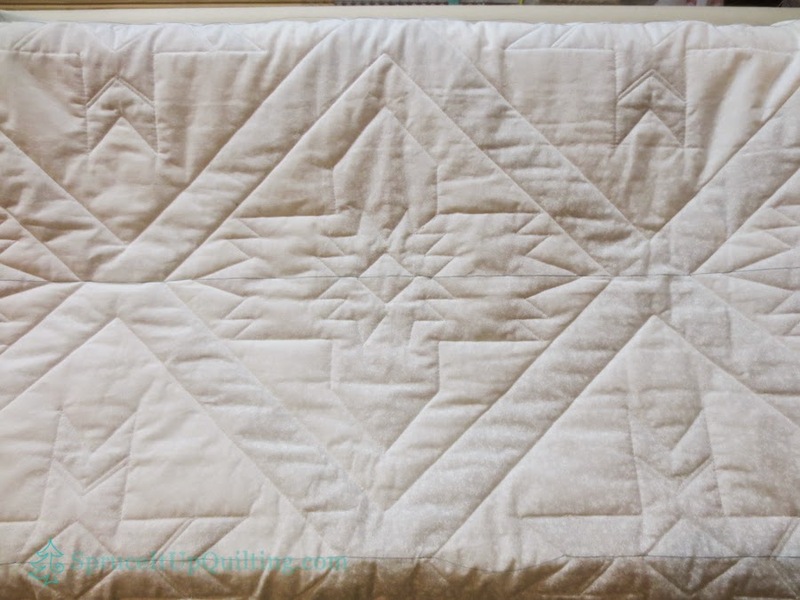 Her appliqué flowers give this quilt a girly look... perfect for the grand daughter who will receive it. Look at these gorgeous prints!! What a collection! 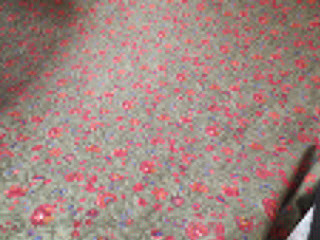 Very pretty backing to match the flowers on the front. 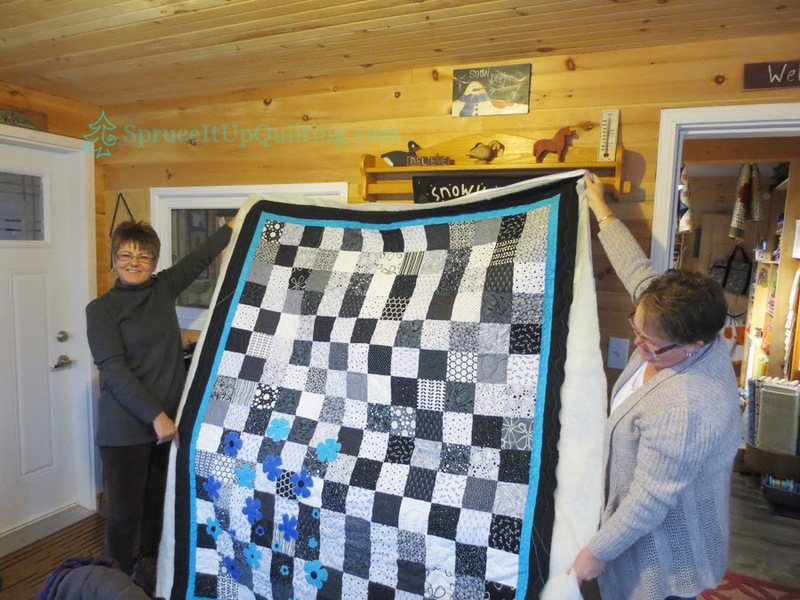 Georgina did such a great job... a very pretty quilt... love the turquoise with the black and white!! I must remember that! And that wool is just soooo soft! 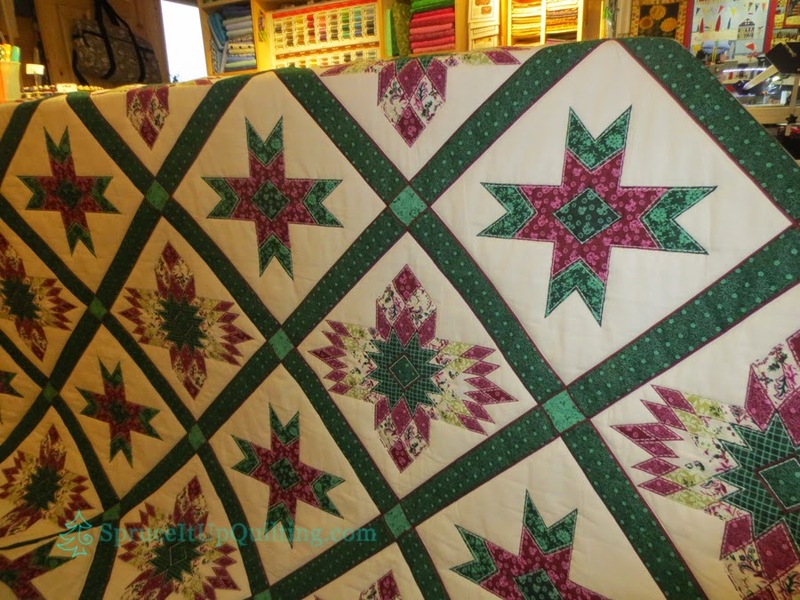 Georgina also brought in another quilt to match a backing... it stole my heart... no pictures yet... you'll have to wait for it! 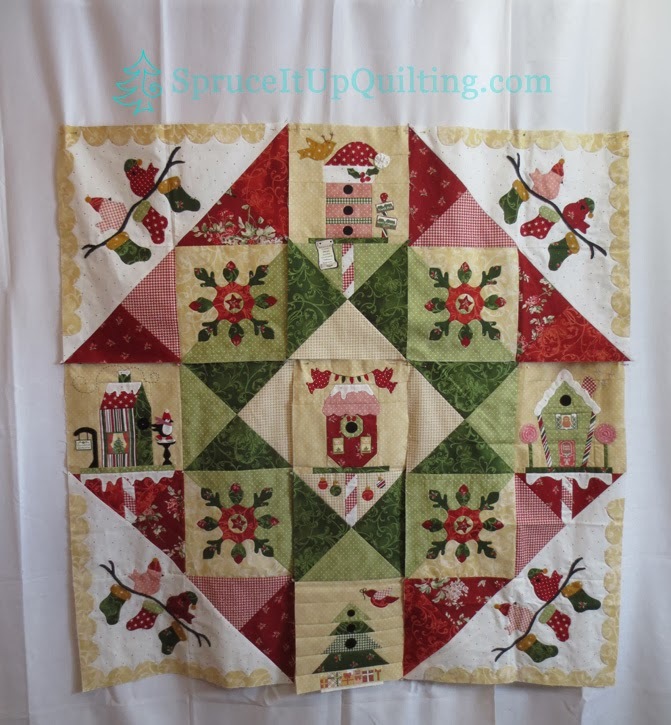 The fabrics are French General in reds, creams and pale green... the fabrics used by Anne Sutton of Bunny Hill Designs in her Merry Merry Snowman quilt. 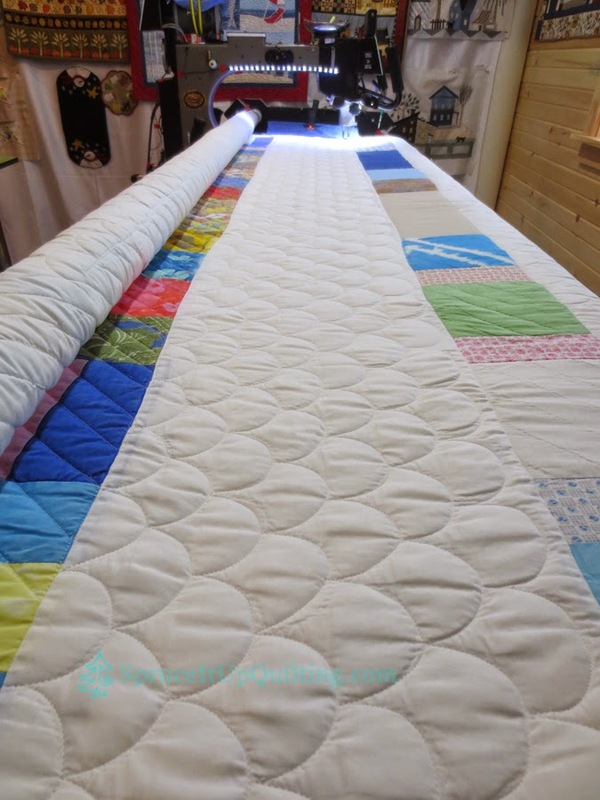 Can't wait to see that quilt quilted! 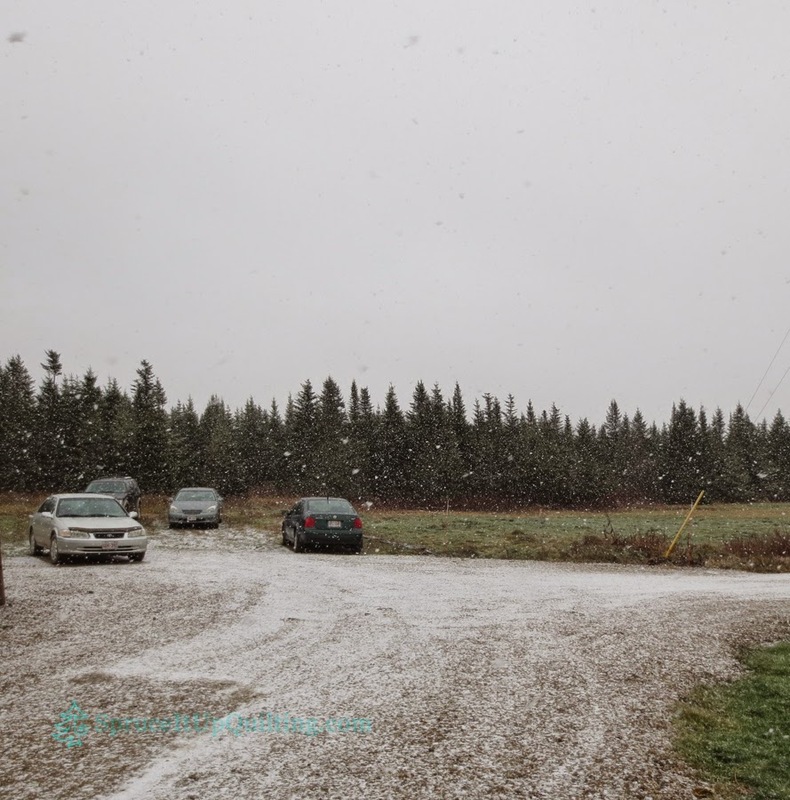 Of course the pictures can't really capture the size of the snowflakes that looked as big as golf balls! 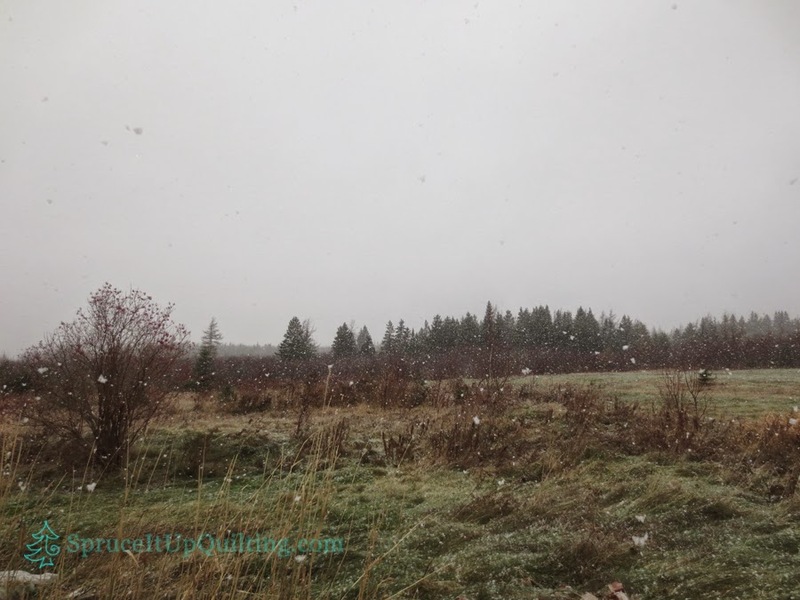 :) Any other day I would have been happy to see the snow but when a loved one is on the road, it's hard to stay focused and appreciate the beauty of a snowfall. 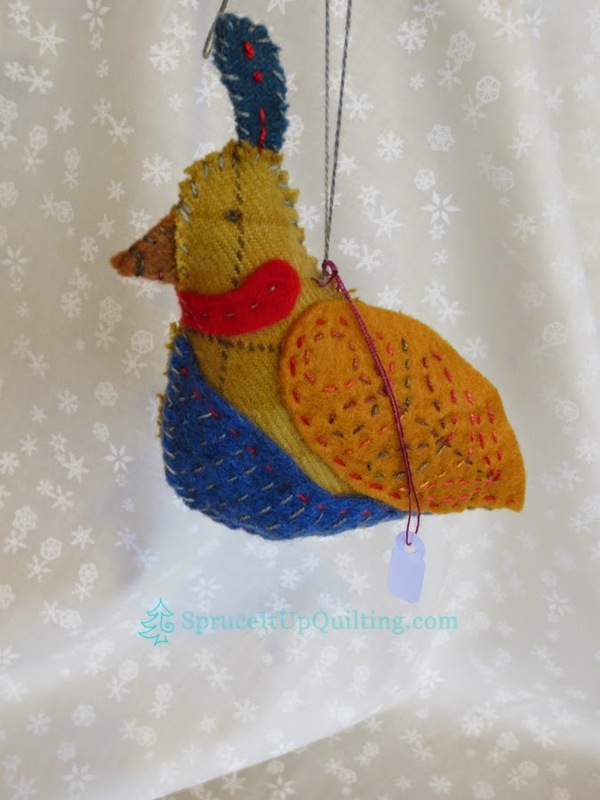 Today is the last day to vote on the Christmas Ornament Challenge! Please take the time to review them and cast your vote if you haven't done so yet. Tomorrow, we'll announce the winner! 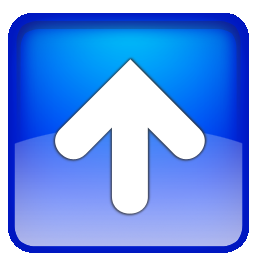 A new feature has been added to the blog... have you noticed? A new page to showcase YOUR talents! SHOW & TELL page went live last week... bring in your finished projects (no matter where you purchased your fabrics/patterns/quilting) and we'll take a picture and feature it on this page! We love to see your work so bring it in! 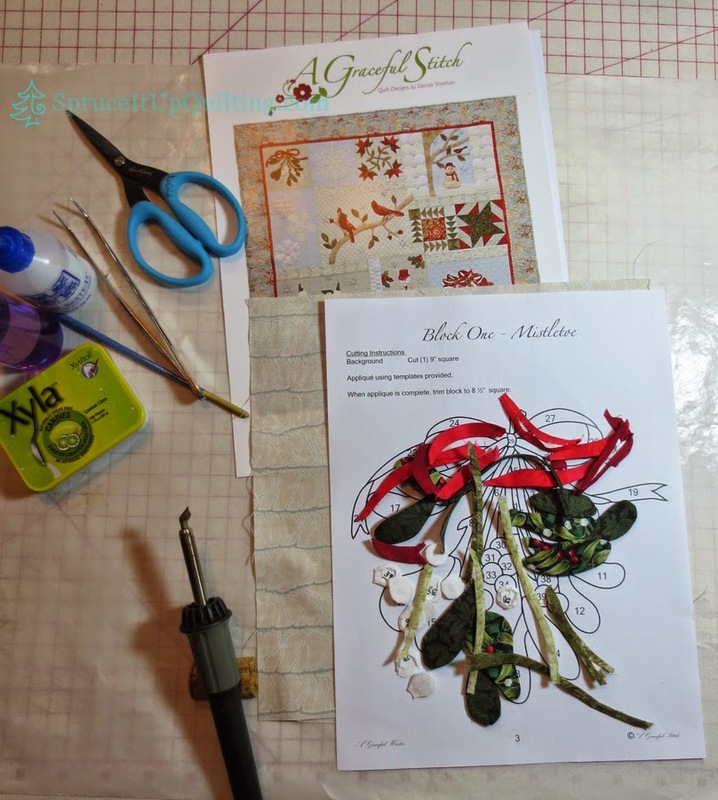 I was invited to participate in Around The World Blog Hop Tour by Ruth at Stitching Impressions! 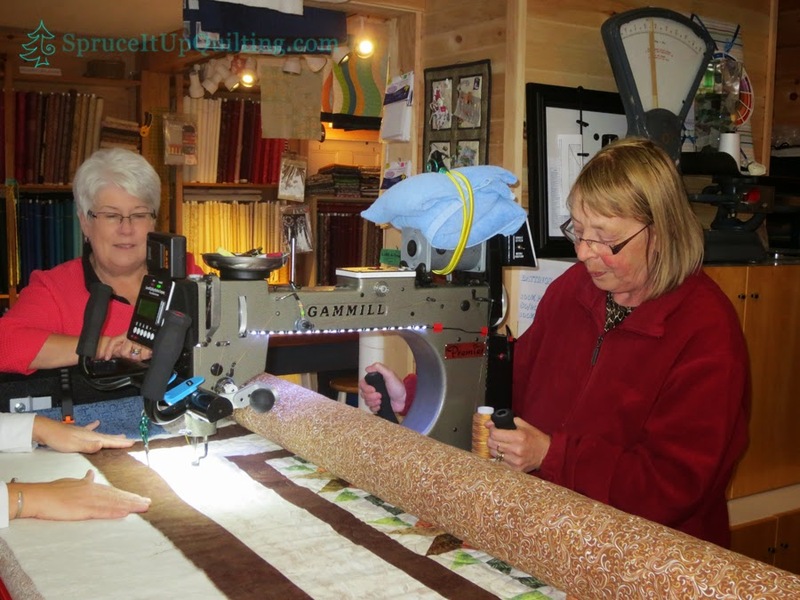 Ruth is a passionate hand appliqué-er and a very busy longarm quilter. 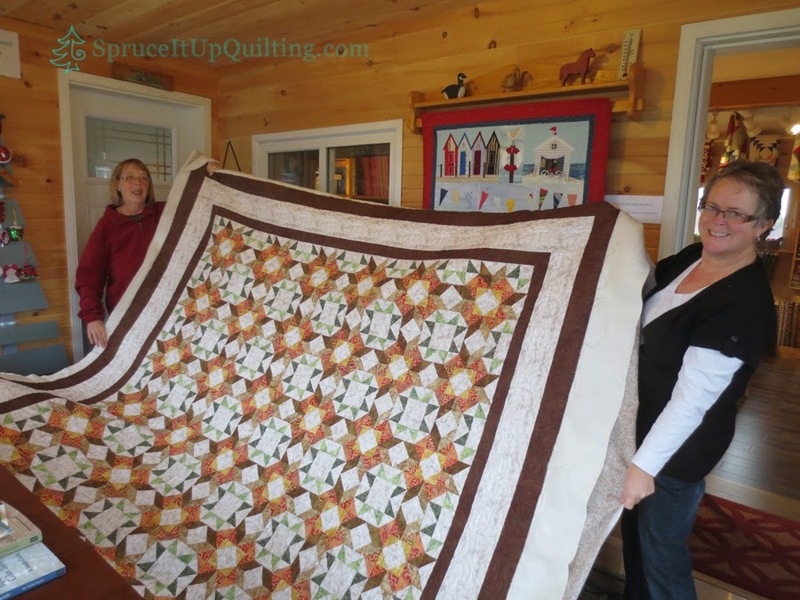 You must browse her blog to see the beautiful quilts she gets to work on and her own gorgeous works of art! 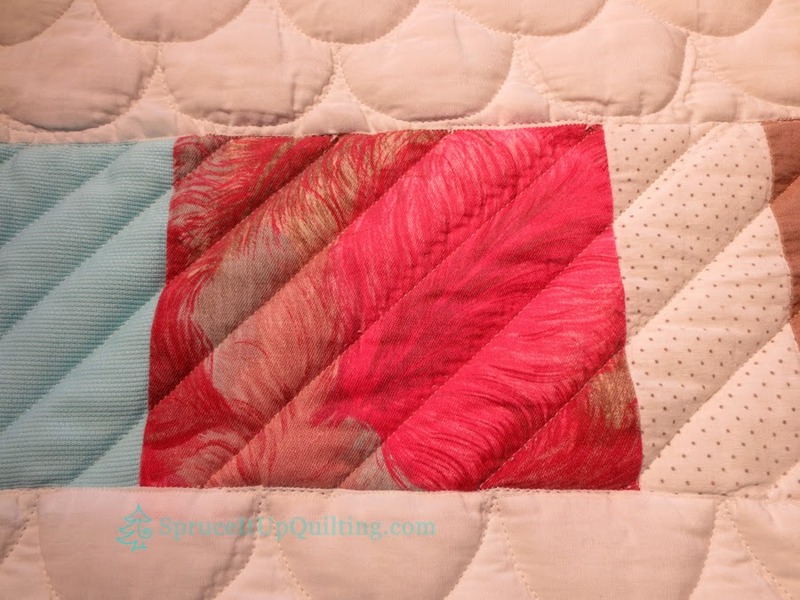 Check out her Lily of Rosenberry quilt. She's truly amazing! This is my first time at blog hopping so please excuse any errors... 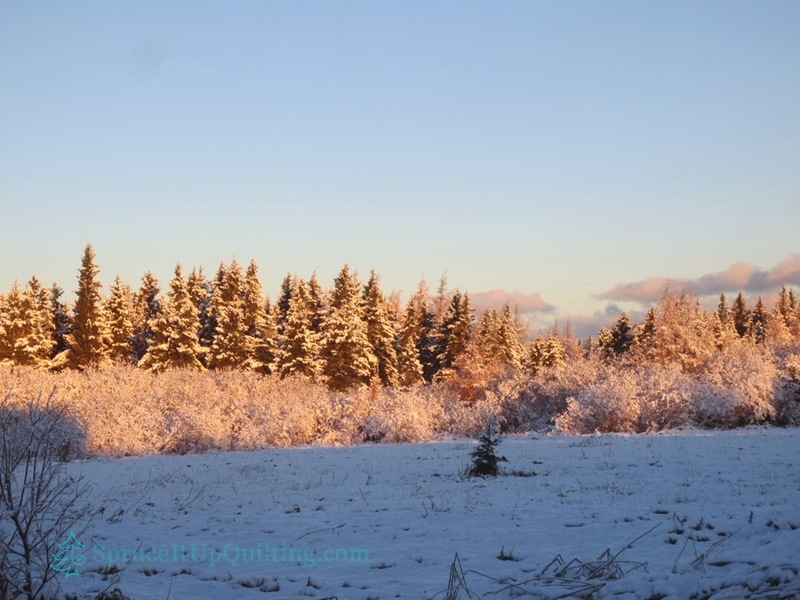 I have followed many blog hops but never participated in one. 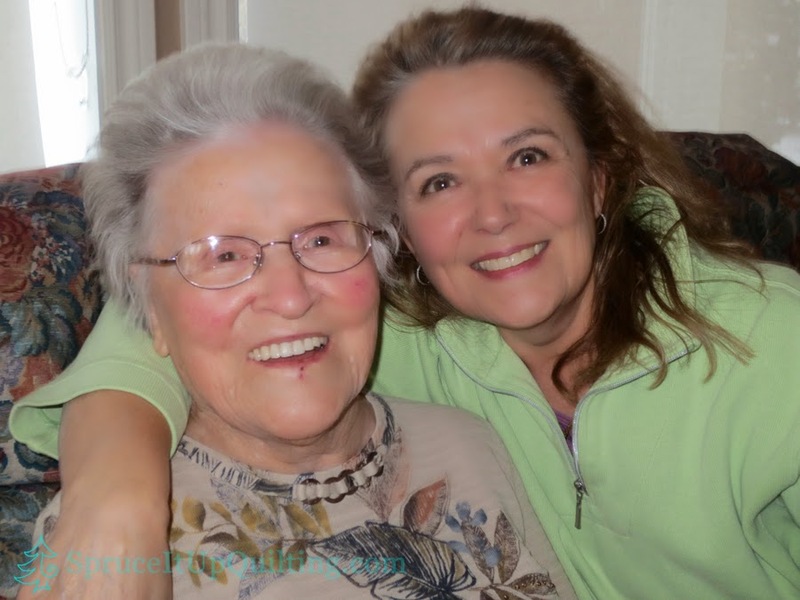 Thank you Ruth for including me in this adventure! Let me introduce myself... I'm Lorette Cole...daughter, wife, mother of 4, grand-maman to 1, quilter since the 70s, obsessed with fabric, and living every one's dream. My husband retired at the end of 2013 and we made the long-awaited move back to the Maritimes of Canada from Los Angeles. We've been preparing for this journey for many years and we're thrilled to be back home. 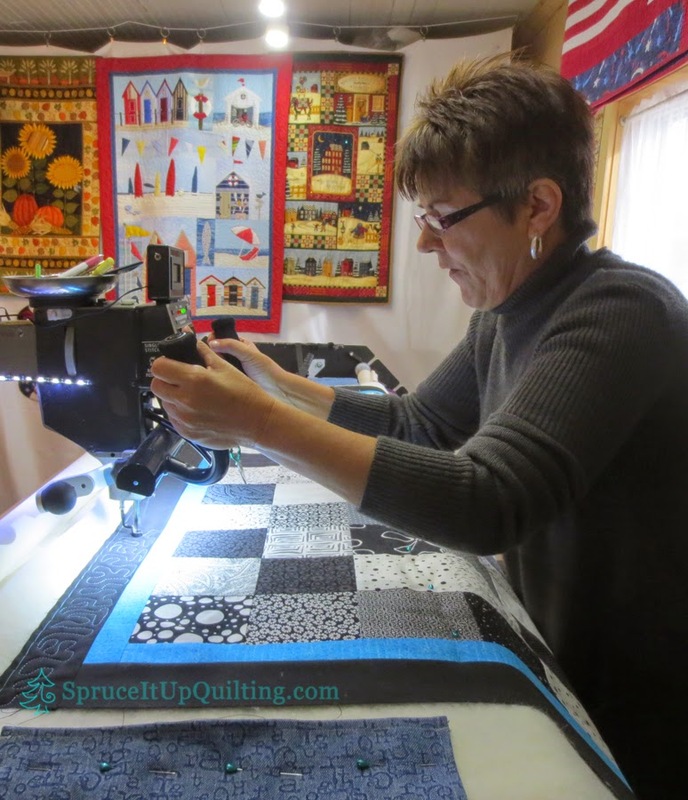 On June 10th of 2014, I opened a small quilt shop in our home, called "Spruce It Up" offering quality goods at a reasonable price. 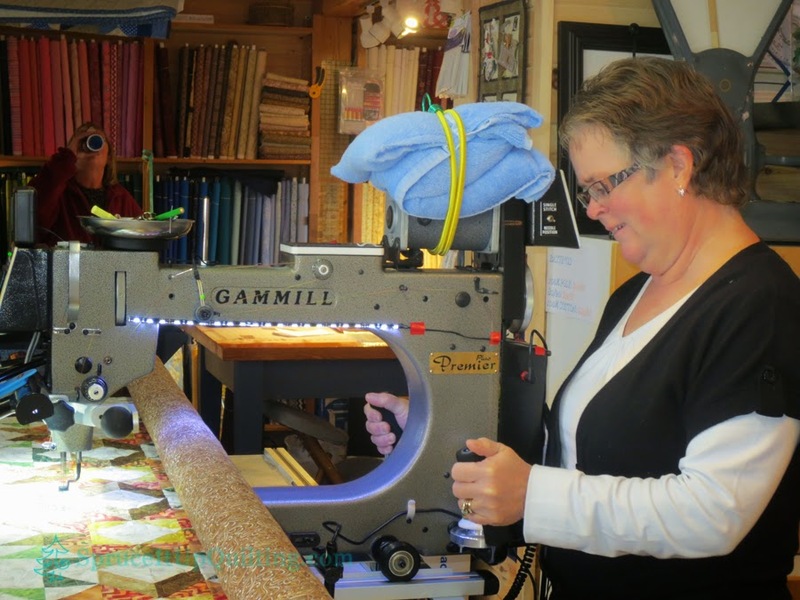 I also offer my longarm quilting machine, which I named Lolah, for rent to local quilters wishing to finish their quilts. 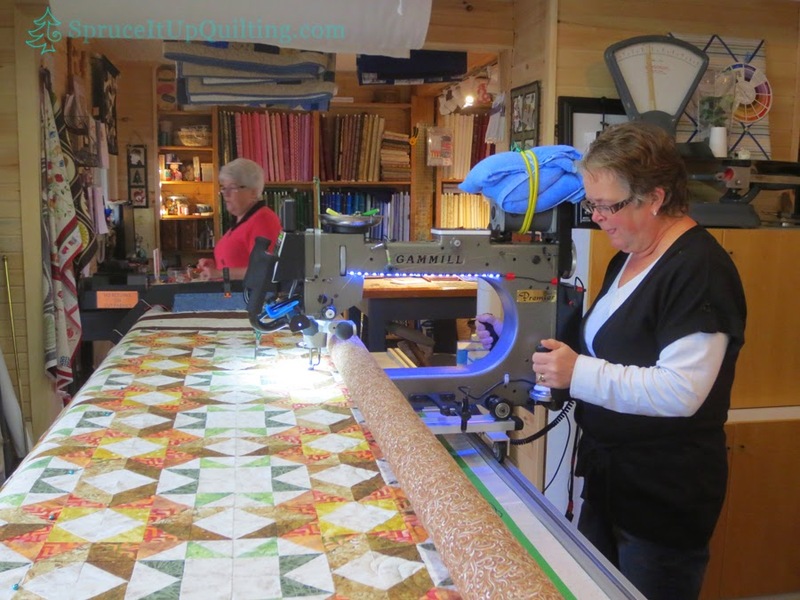 Face it... we all love to piece tops but we don't have time to hand quilt all of them. 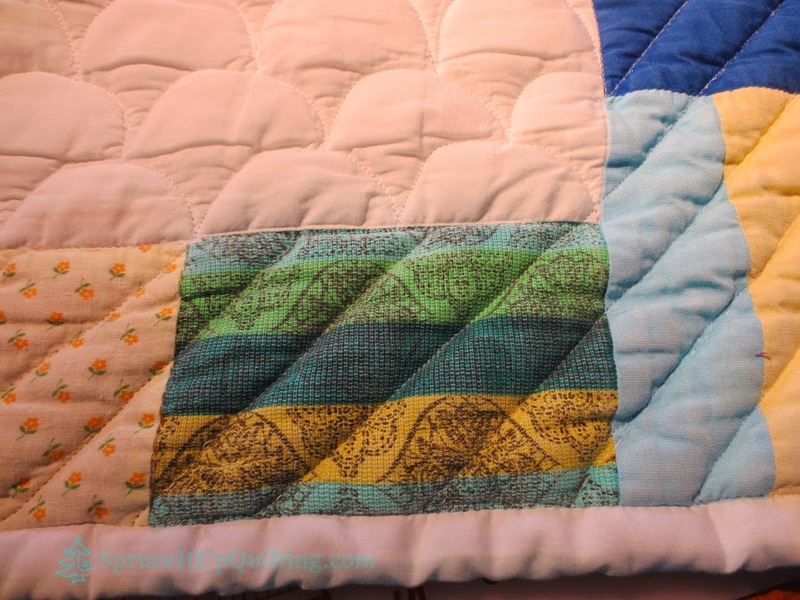 Do you remember Yoko Saito's Quiltmania 2012 Quilt Mystère? 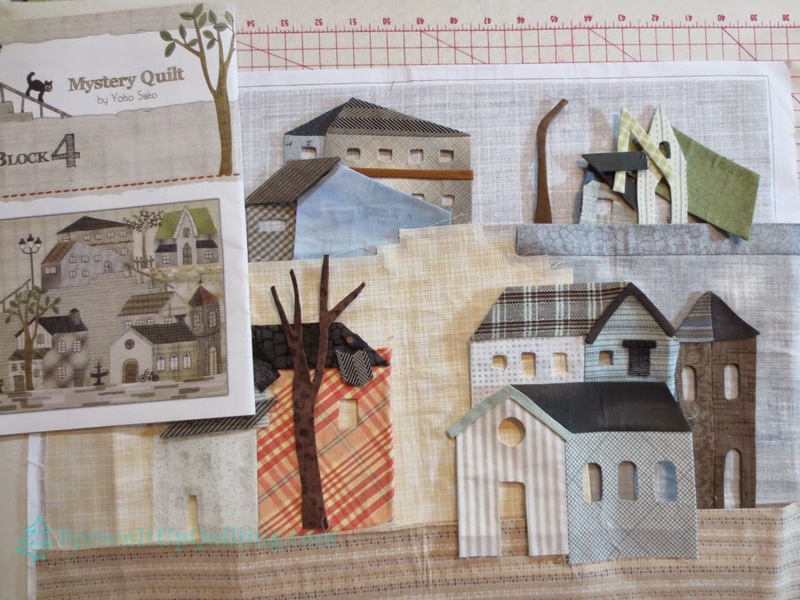 This is block no 4 which has been sitting on my crafting table since August. I have not found time to get this ready to appliqué! I wish there were more hours in the day! Perhaps winter will allow me time to catch up. I really love appliqué and I teach my favorite method to anyone who walks through the door of the shop. Maybe I've made converts? 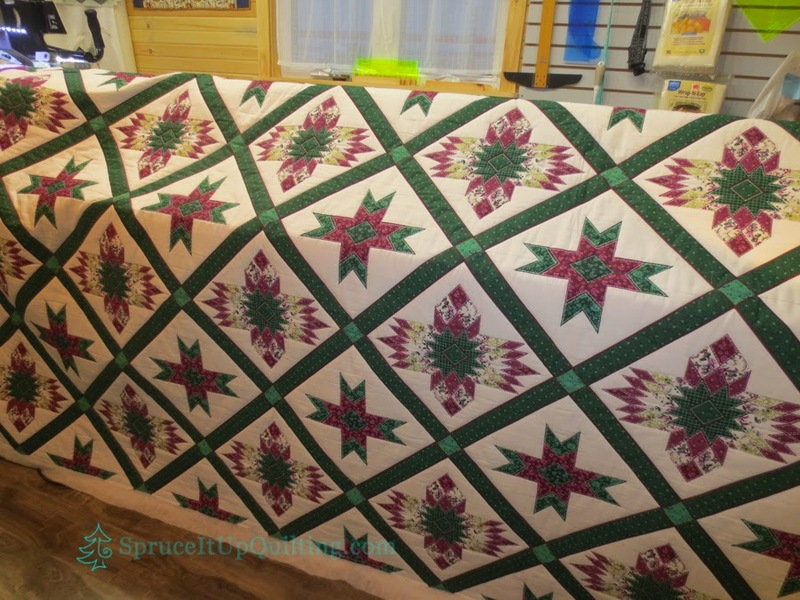 This is another project ready to put together for appliqué... 2015's Block of the Month at Spruce It Up Quilt Shop. 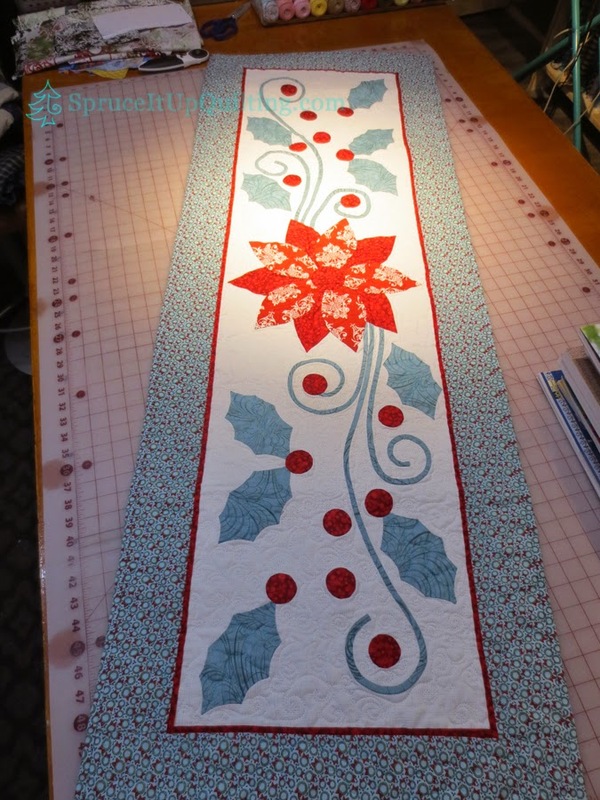 It's called A Graceful Winter, a beautiful pattern by Denise Sheehan. Care to join us?? I'm happy to have several projects on the go. I learned years ago that when you get tired working on one project, a change of pace is needed. 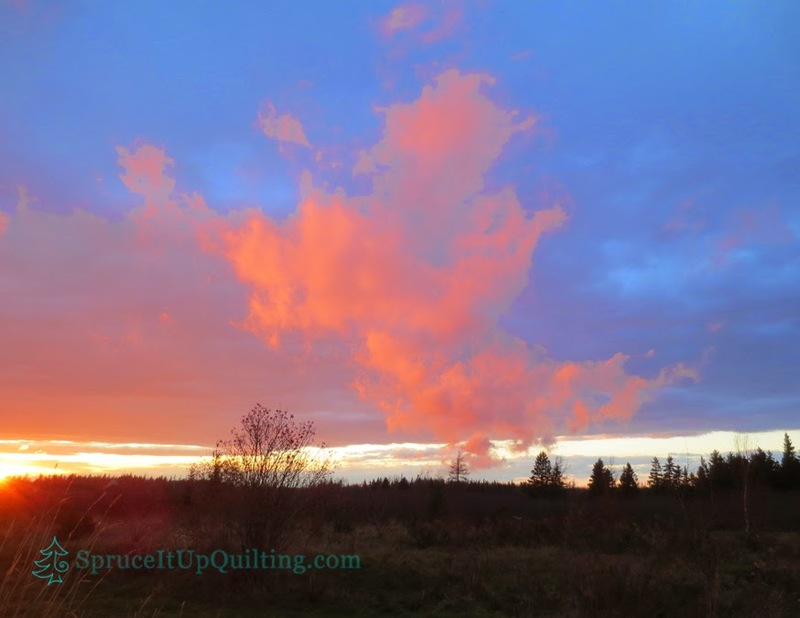 It breaks up monotony, allows a fresh view, gets more creative juices to flow. I've had to pause this one as more pressing projects landed on my table. These borders have to be redone; I've started un-stitching, never a fun task but it has to be done before I can move on. I don't believe I'm that much different from anyone else. 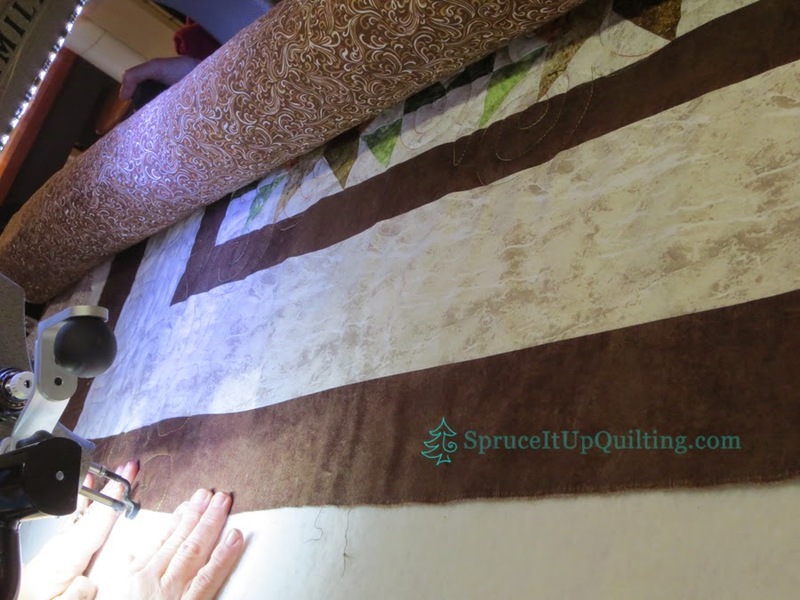 I stash fabric and projects just as quickly as most of you; there doesn't seem to be enough hours in the day to make all I wish to do. 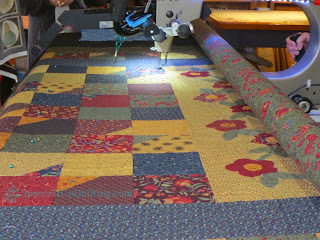 However, because I offer rental time on my longarm, I get to see a lot of very creative people's work. 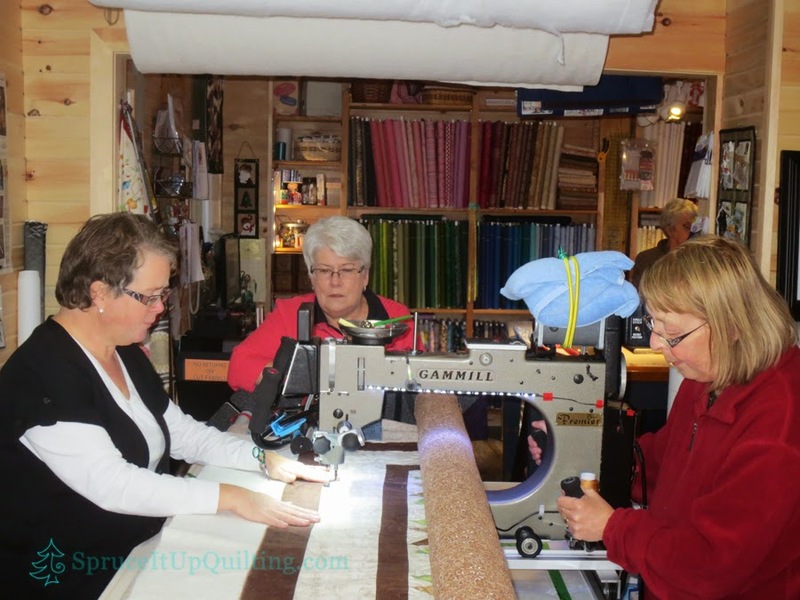 I'm very fortunate to get a chance to teach others how to use the longarm to finish their creations! 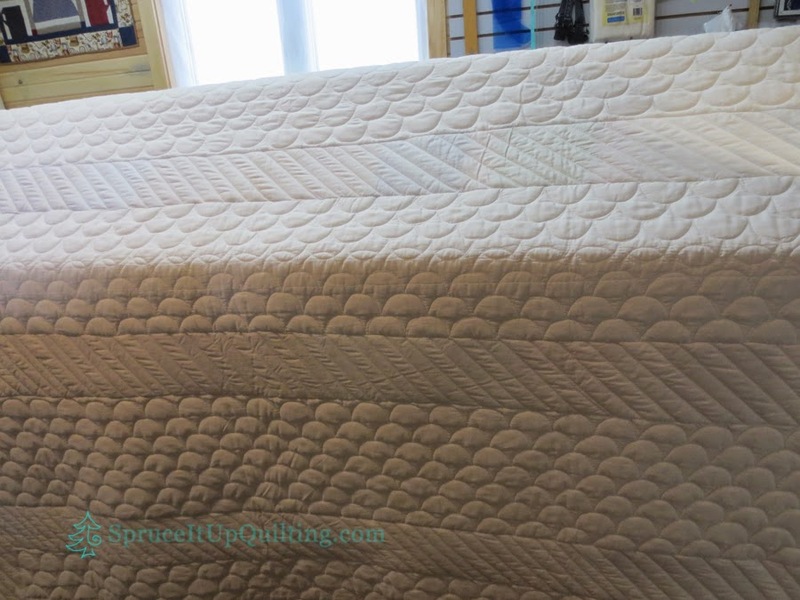 The joy of seeing someone with their quilted top counts as the utmost thrill! 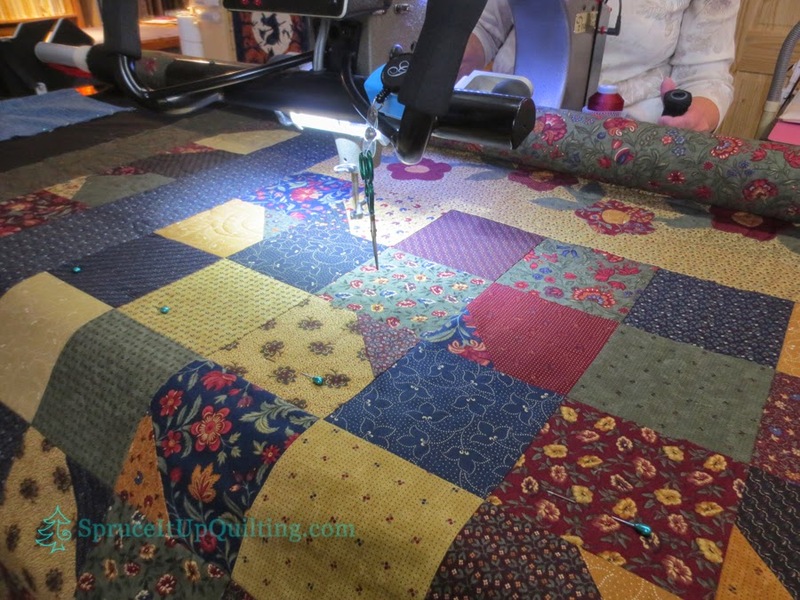 That makes me happy and I hope the quilters who come to rent time on Lolah enjoy the process. 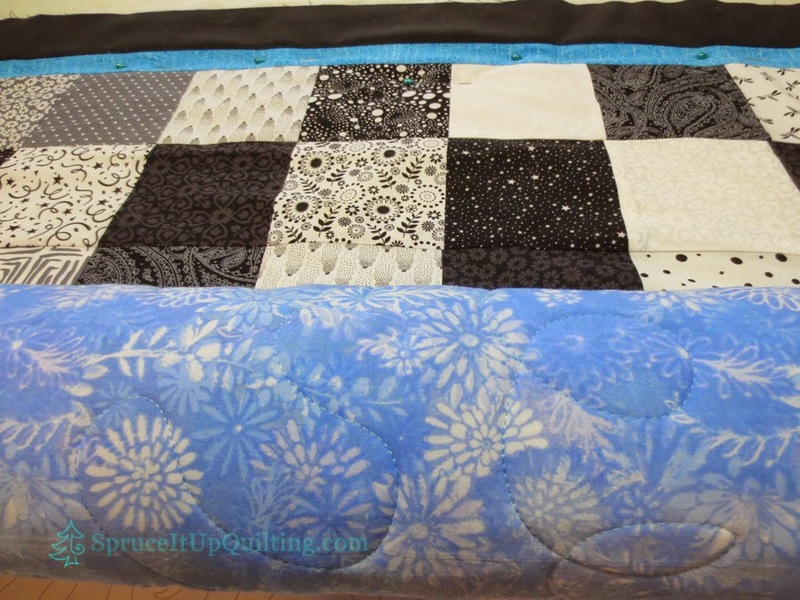 Seeing so many beautiful quilts gets me inspired too. Also, if I like something, I am quick to work it out... I know what I like and for the most part, I'm able to recreate it. This is a piece I found irresistible in the Nov/Dec 2014 American Patchwork and Quilting magazine. It will grace our dining table this Christmas season. Did I tell you how much I LOVE appliqué? 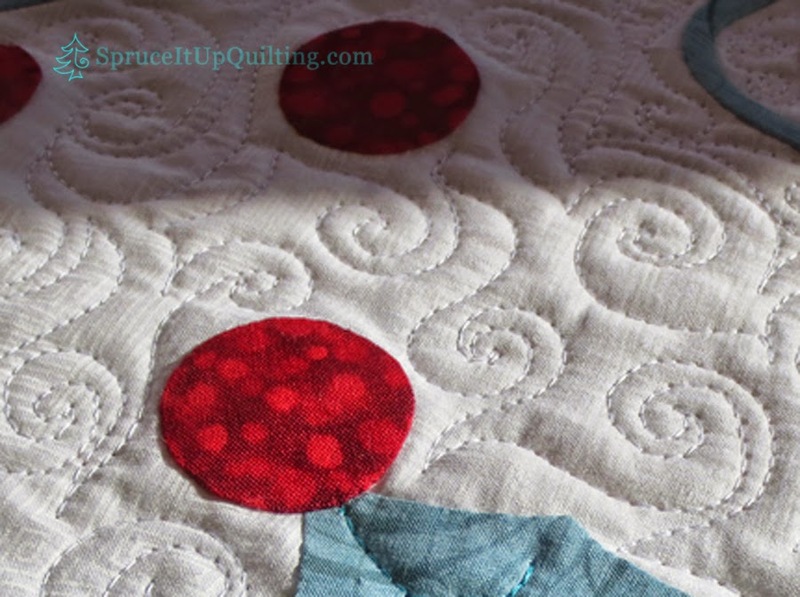 It opens the door to so much more... you look at patterns differently when you appliqué! That's a question with a simple answer: because I love it! Perhaps what helps too is the inability to sit with idle hands. Therapy... Sewing grounds me... I use it to work out problems, pass the time, to create something useful, something beautiful, something to gift, something to save, something to cherish! Crafting is in my genes... I can't remember a time I didn't "craft"... 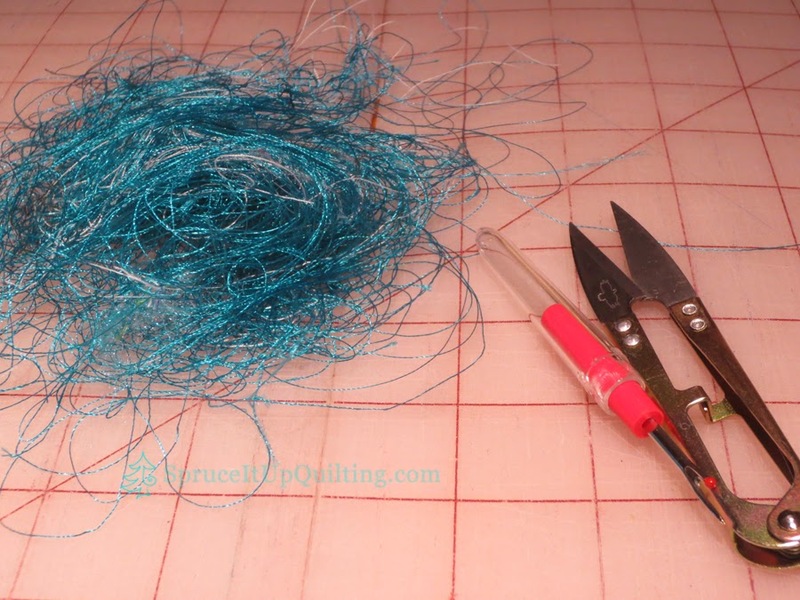 I've knit, crocheted, cross stitched, embroidered, tole painted, water colored, played with wood working, scrap booked, but the one constant in my life has been sewing. I can sit at the sewing machine for hours and resolve any issues that crop up. I do my best thinking while sewing. 4. How do I create? I can't say that I'm very original. I'm very good with instructions! Give me a good photograph, or drawing and I can make it into a pattern. 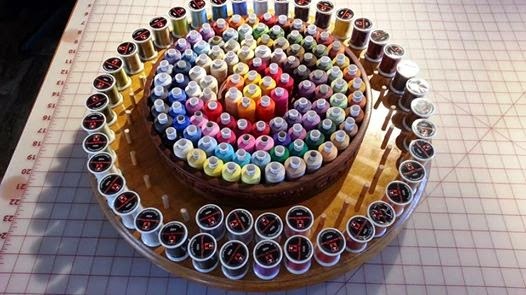 I love to re-purpose useful articles: for example, when I needed a display for thread, I found a lazy susan and had DH drill holes for dowels. It works beautifully. I get inspiration in the beauty that surrounds us... Colors, patterns... 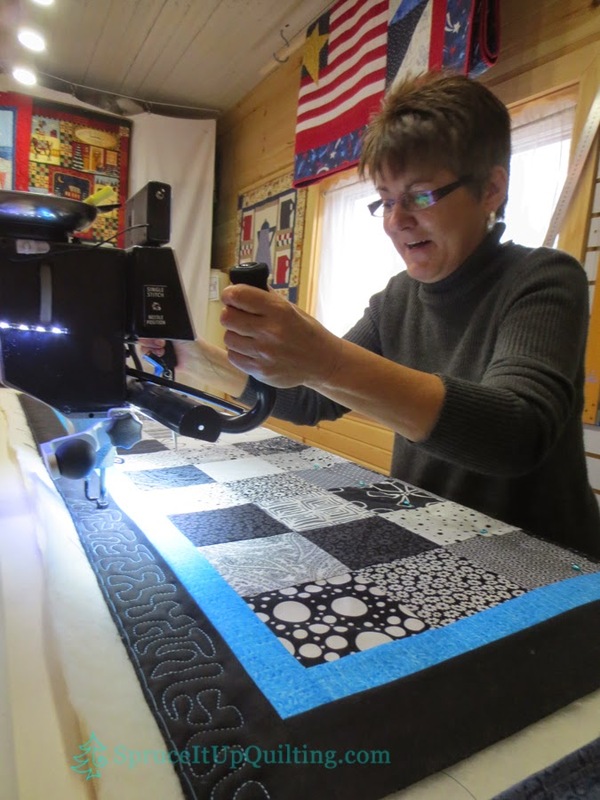 I've joined 3 local guilds where I've met many wonderfully creative quilters. 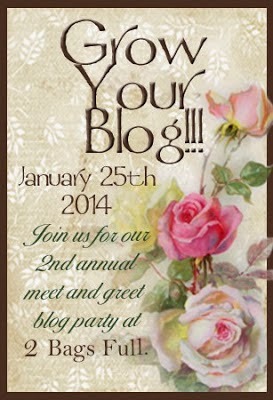 Thank you Ruth for asking me to join this trip Around The World Blog Hop. Next up is Chris McCarthy from KrissteezKreationz. She's a very busy lady so her blog may not be up to date... perhaps this will inspire her to update us all on her work. Look for her on December 1st. While I have your attention, this is the last week of voting for the Spruce It Up Christmas Ornament Challenge... take a look at them now and cast your vote please. Voting ends November 30th and a winner will be announced on Dec 1st. Come back then and purchase an ornament or two... it's for a good cause! The ornaments can be found on their own page... found at the top of this blog! And thank you for taking the time to read this long post! Come back on December 1st to see who won! Lorette met with Lolah on Wednesday. 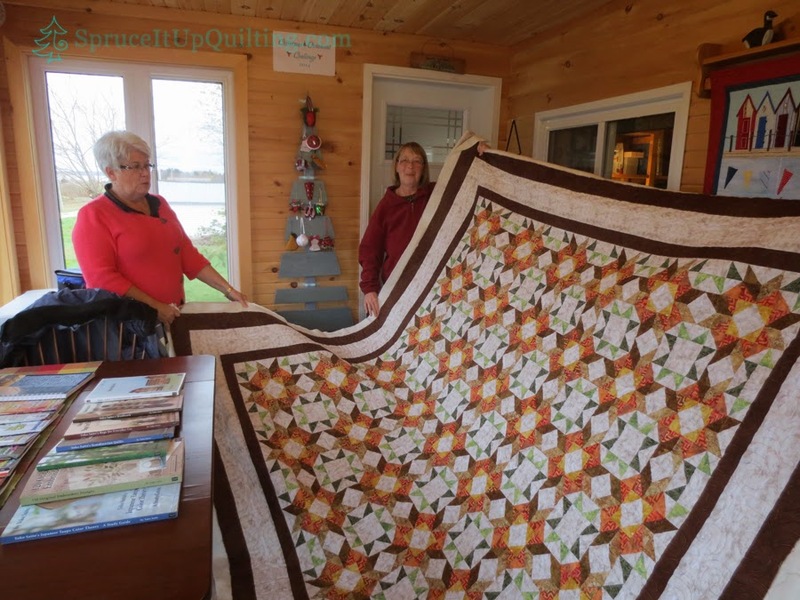 This is Roberta's antique quilt. 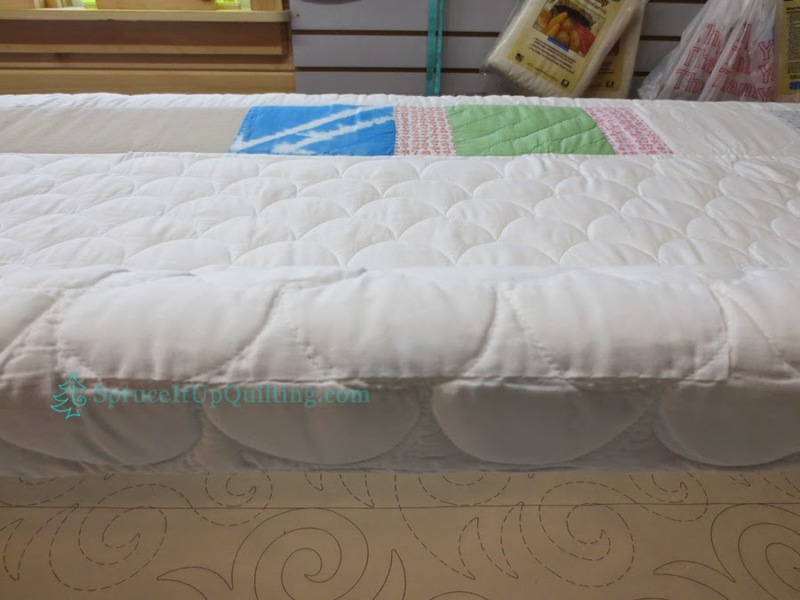 It is made of a mixture of polyester and cotton fabrics and the quilt batting has a super loft, not something Lolah works with often. 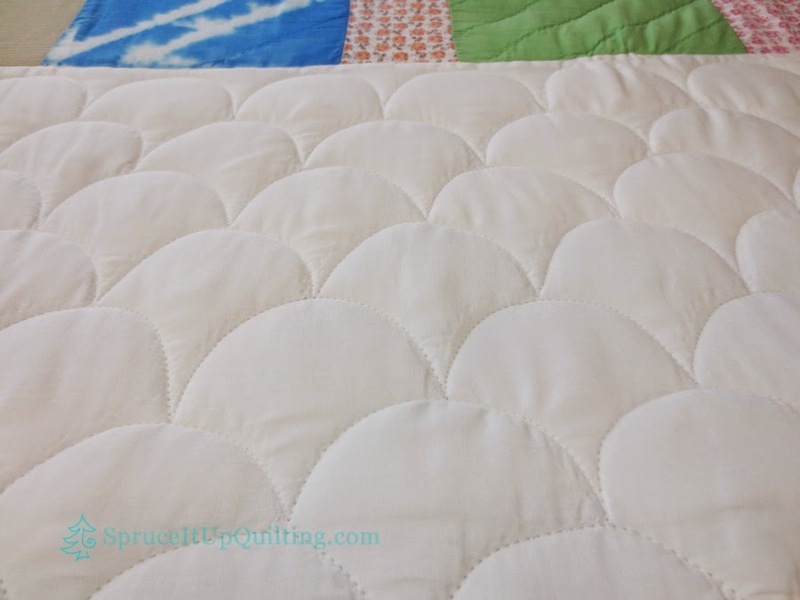 The binding consists of the backing folded and stitched to the front and the batting makes the binding as puffy as the quilt. 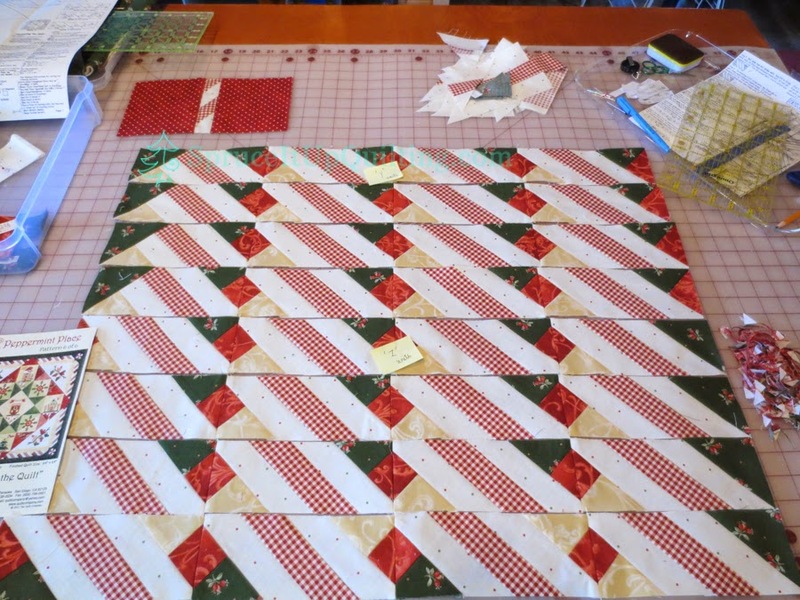 The red snappers would not be happy with the bulk since I was not taking the binding off to quilt this. 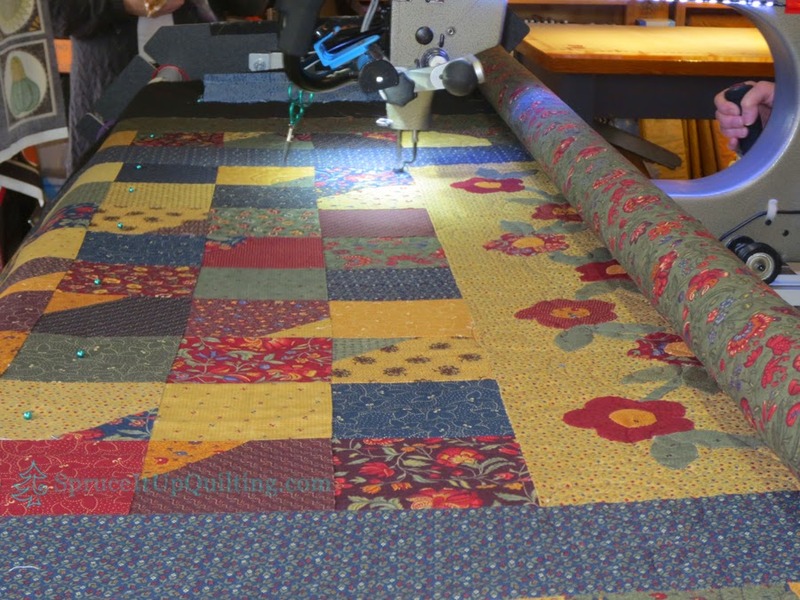 My first objective was to make a leader fabric to which the quilt could be pinned then attached to the frame's leaders with the red snappers. 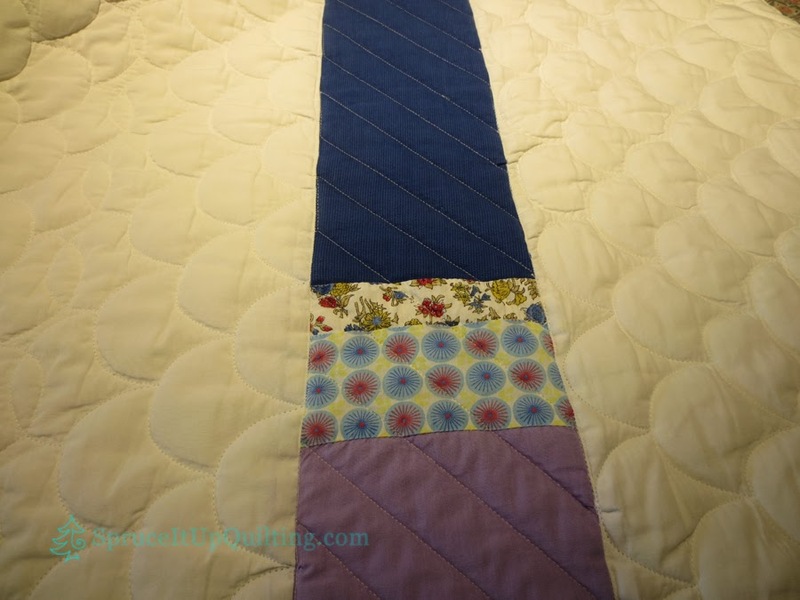 Lolah did her best to quilt right up to the binding's edge; it was a challenge best done slowly and carefully. 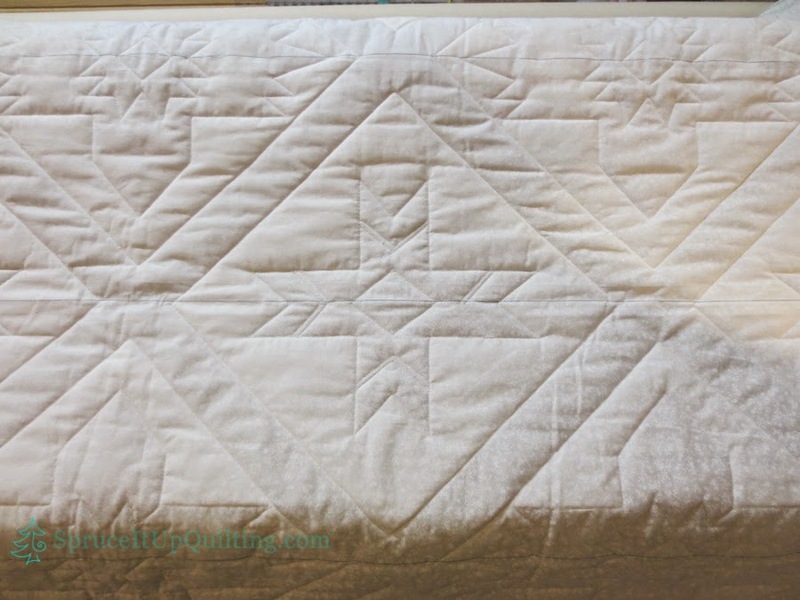 Roberta asked to have it quilted simply, straight lines would do but I couldn't do that! 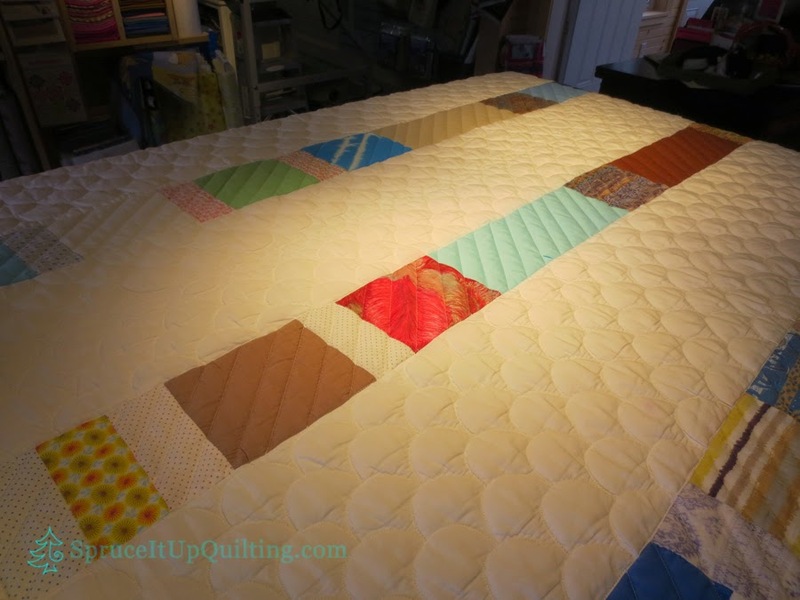 Very little of the previous hand quilting remained but the stitching lines were still visible. I just followed it along as best I could. 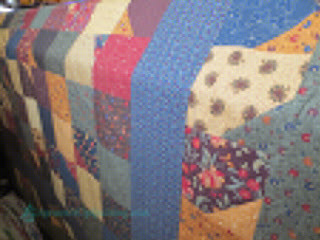 Some of the fabrics show wear; in places, the quilt has been repaired a few times, restitched in others with top stitching. 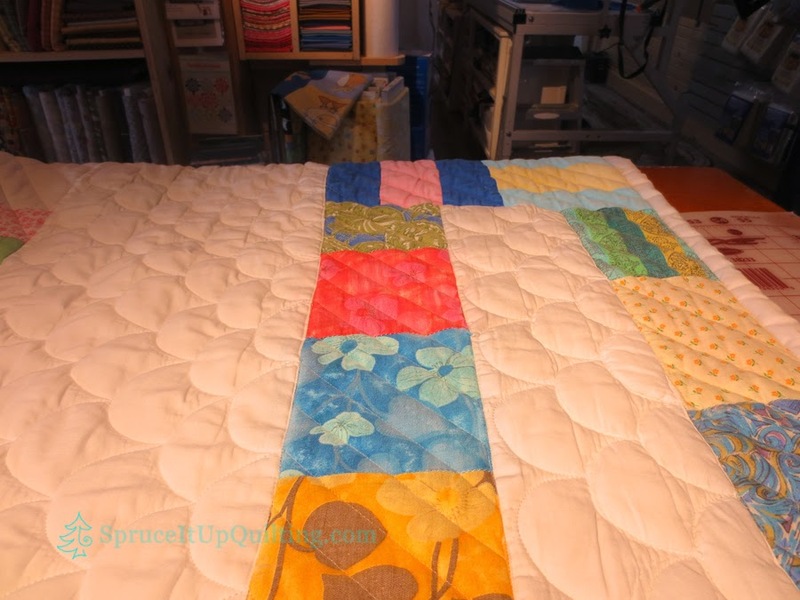 Some of the lines were not straight and I kept them that way... Lolah didn't mind following the "groove" in the lofty batting left by the hand quilting. 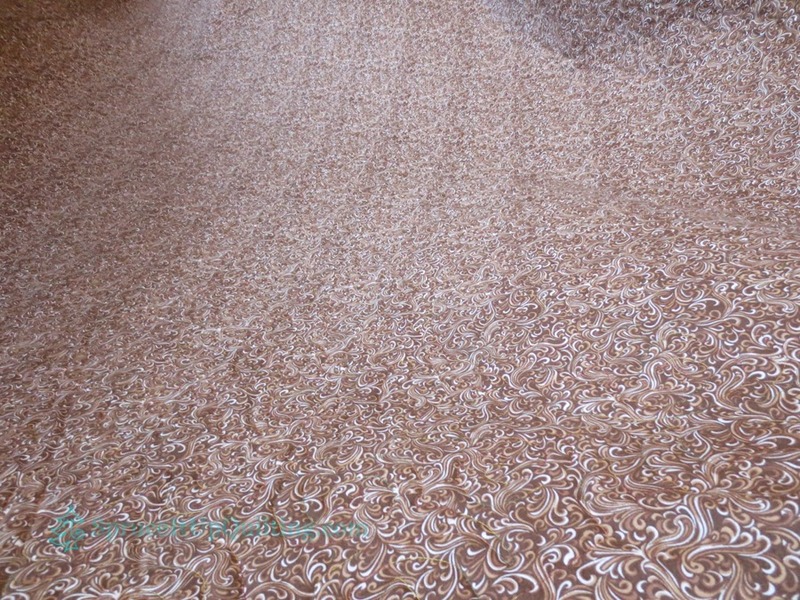 Look at these fabrics... some are quite lovely! 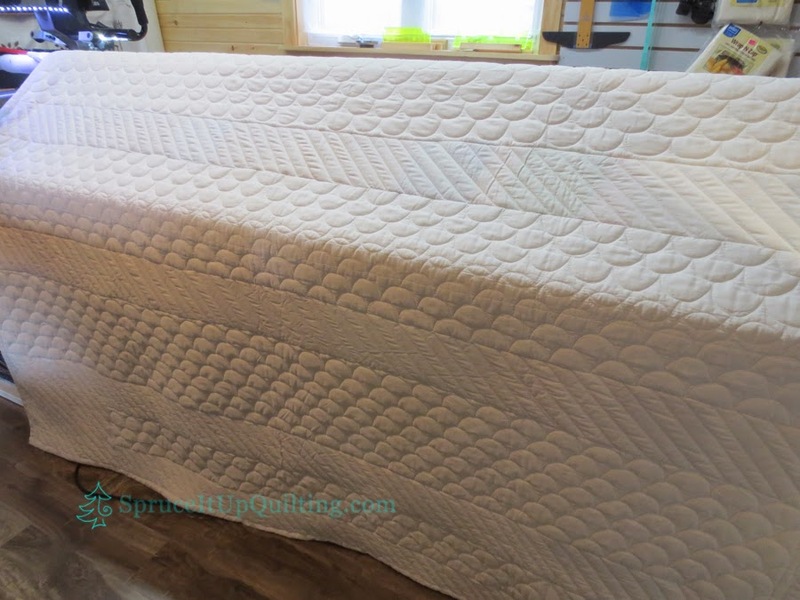 This is the first time I quilt the clam shell! I had no template or rulers that fit this size but it was quick to stitch it free hand. I used Permacore in white top and bottom. 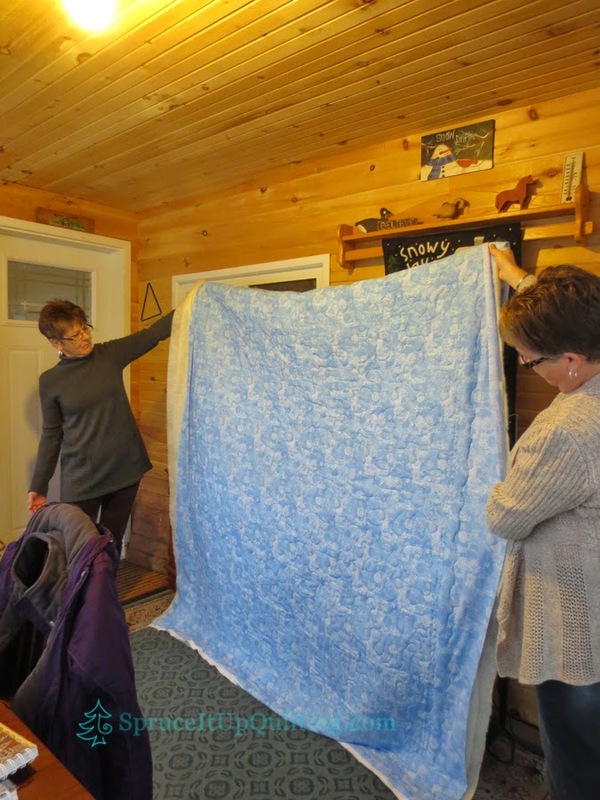 It's not a large quilt by any means but it was made by her mother and grandmother and it means a lot to her to preserve it. I hope Roberta likes it! Come meet Lily, Lolah and Lorette this week... one of them is having a birthday... and that means a sale!!! Carol's trip to Spruce It Up was made with joyful anticipation but at the same time, with a good deal of apprehension... butterflies were mentioned... but OH! 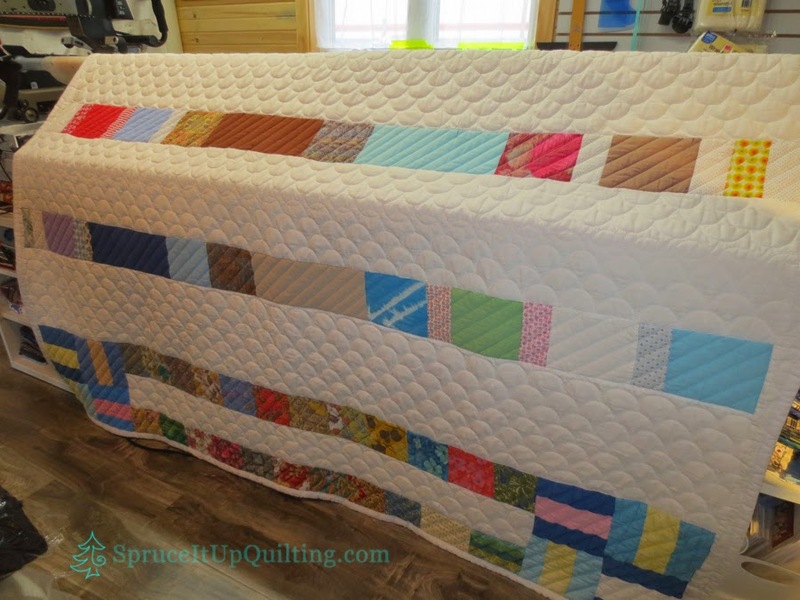 Look at this gorgeous quilt. Stonehenge, batiks, and some glitter... so pretty. 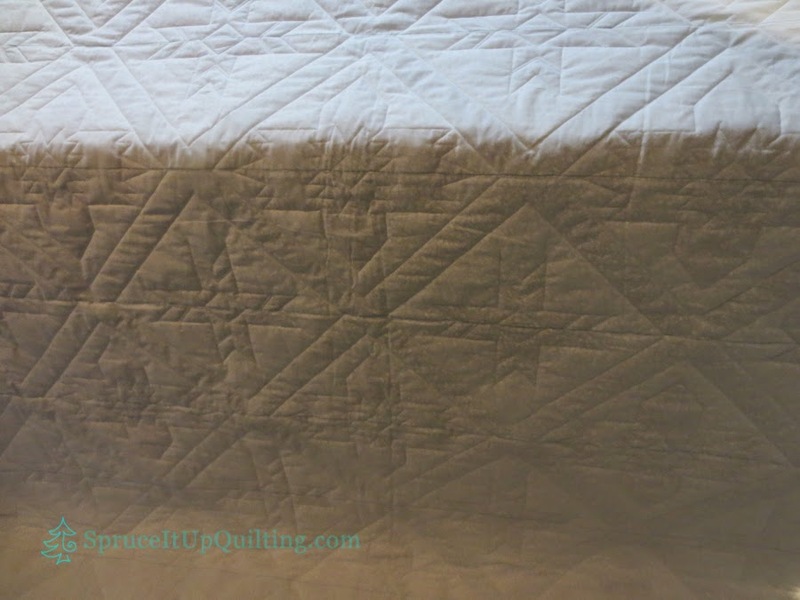 It's expertly pieced too, making quilting an easy job. 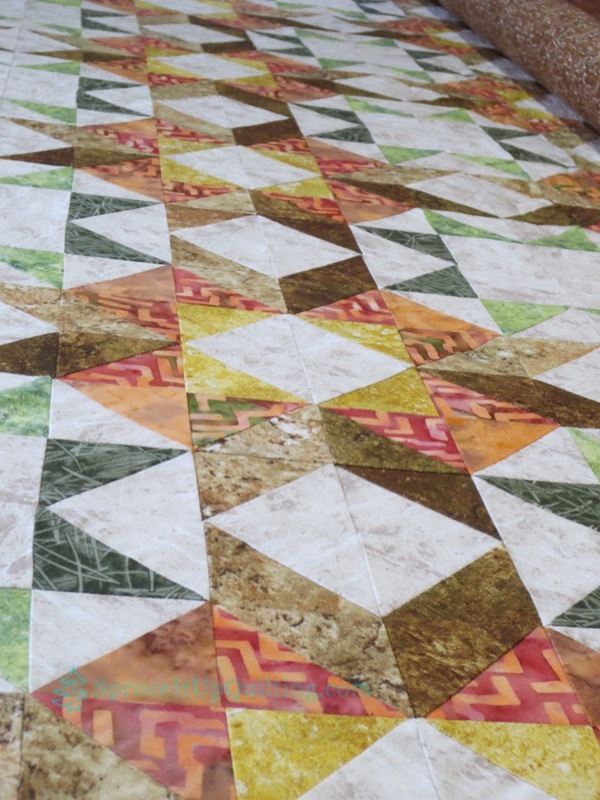 She chose Vanilla Cream pantograph by Anne Bright with Superior Threads King Tut Variegated #906, a beautiful mix of oranges, greens, browns, yellows. That's Carol in the center between Holly on the left and Bernice who came to offer support. 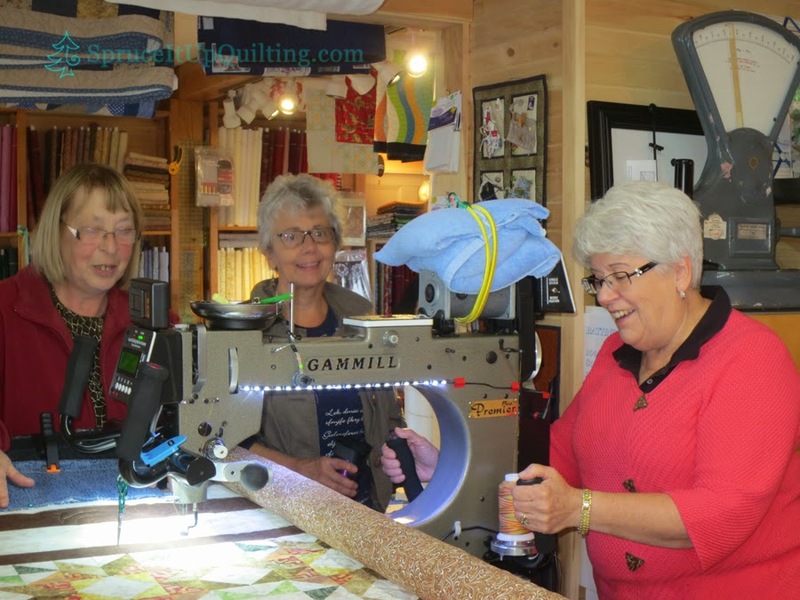 Quilting on Lolah though is Joan! Why, do you ask? 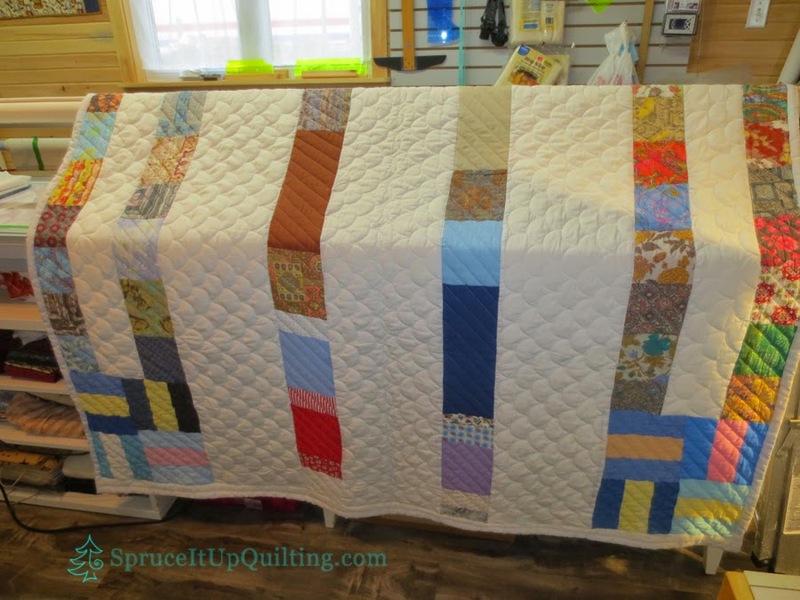 Carol had some shopping to do... she did manage to quilt several rows of the design but she was willing to let others also get the chance to try out Lolah! What a great friend! There she is... working the last row and the finishing touches! 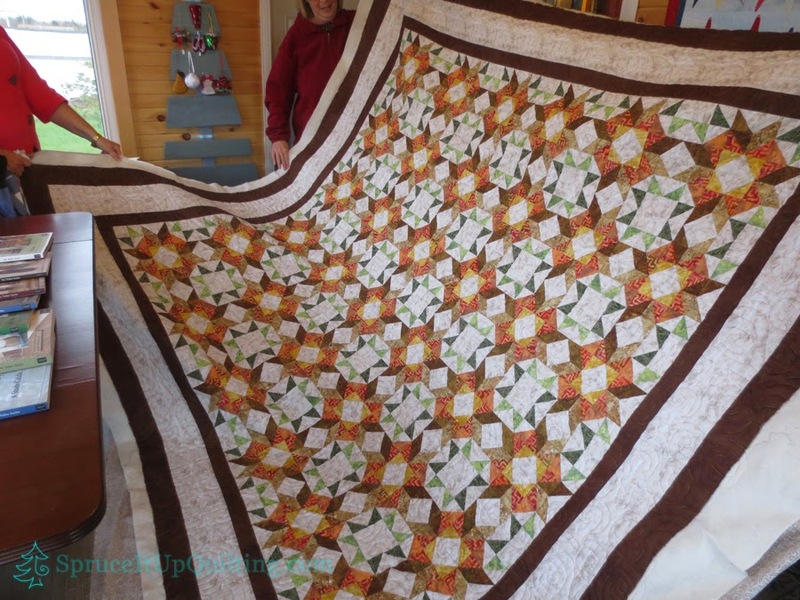 What a gorgeous quilt Carol! 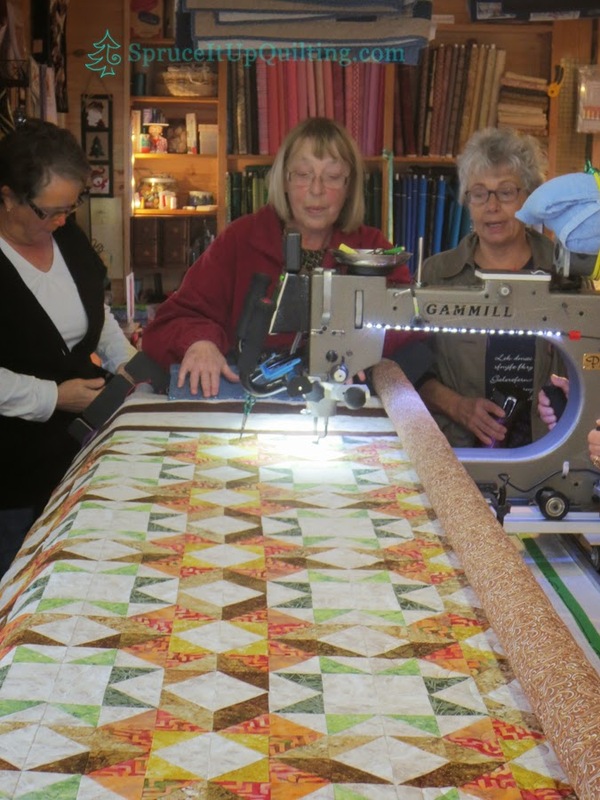 A great job collaborating on the quilting ladies. It's a beauty and I'm sure the recipient will be thrilled to get it! The stitching on the back is hardly noticeable but the texture is quite lovely! There's something about fall colors that warms my heart and these are so pretty... Doesn't it look cozy? Carol I hope your butterflies are gone now. 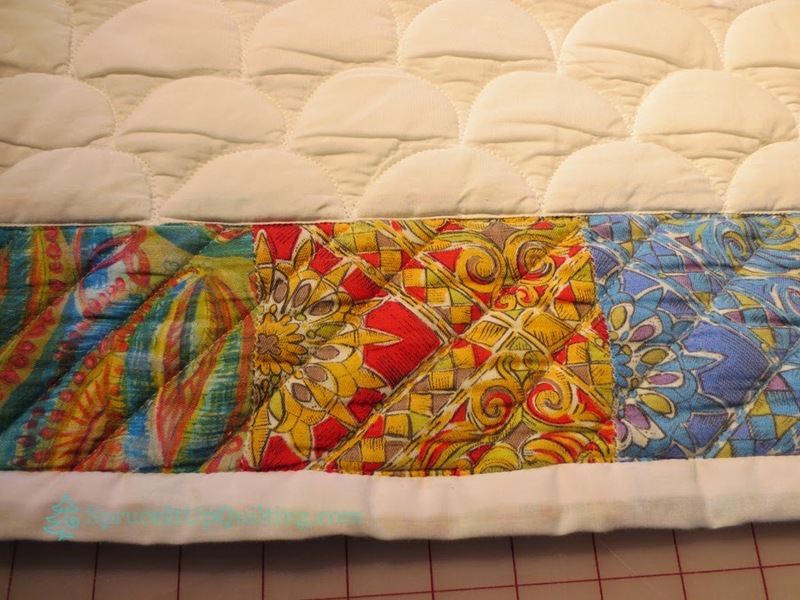 Your two-toned binding will look awesome. Lolah is loving all this attention girls... come back soon!